Just west of Duncan and Clayton Rd in Champaign sits Westlake subdivision. A residential development consisting mainly of single-family homes and a scattering of duplex/zero-lot style properties. It’s a convenient location in NW Champaign. Easy access to highways and interstates, close to Parkland College, Prairie Gardens and a short drive to the North Prospect shopping, restaurants and entertainment. Homes in this neighborhood range in age from 13-27 years. 4 out of 5 of these homes are 1-story properties and with an average size of 1540 sqft. Typical lot dimensions are around 70′ wide by 110′ deep but dimensions vary quite a bit in the area. Westlake subdivision contains 2 lakes and each lake is surrounded by homes (with great views!). Just north of Westlake sits Powell Park. Just shy of 4 acres, Powell Park provides a playground, basketball court and plenty of green space. 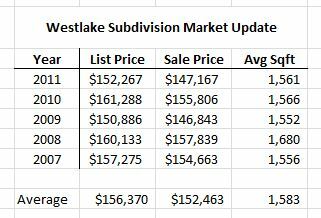 Average home prices in Westlake over the last few years can be seen in this chart. Values have fluctuated along with the average size of homes sold,. If Westlake is an option in your home search and you have other questions or would like to know more about the real estate market in this area contact me online or call 217-239-7114. We’ve helped clients buy and sell homes in Westlake and look forward to doing it again soon!